Several years ago, I spent an entire month in Argentina and I do not recall ever seeing chimichurri sauce on the table. How could this have been possible? Was I blind? How could I have traveled from the grassy Pampas to the Bolivian border without once encountering this iconic sauce? Since that trip, I have yet to see a something about Argentinian steak-eating that doesn’t make reference to chimichurri — that fabulous amalgam of parsley, garlic, red pepper flakes, vinegar, and olive oil — as being the ever-present condiment. However, I can honestly and sadly say that I never had it until I returned home. It’s not like I wasn’t eating meat over there. After a leisurely breakfast of sweet, flaky medialunas and large cafe con leche, I would wander out into the street and try to figure out where to have my next meal — which would always be steak. Yes, this was the decadent month where I had steak for lunch and dinner every single day, washed down with gallons of highly-alcoholic Malbec. Did I get sick of the repetitiveness? No. Did I eat anything else? Yes. Empanadas (both the meat and the cheese-filled varieties) and dulce de leche-stuffed alfajores filled in the nooks and crannies in-between meals. Was it healthy? Most definitely not! By the time that me and my travel companion ended our trip, our alcohol tolerance was through the roof and we could document how much we had swelled in pictures. Looking at them chronologically was like seeing time-lapse photographic evidence of weight-gain. Was it one of the most delicious vacations of my life? Most definitely yes. Perhaps if I had seen either a bottle or a bowl of chimichurri sauce, I would have foregone the pathetic green salads that we would order in an effort to ingest something healthy. Who were we kidding? Those little bowls of greens were only gestures, mere tokens of the balanced diets we left behind in favor of steak, steak, more steak, and llama carpaccio. Chimichurri is an excellent accompaniment for grilled and roasted meats. It’s green, garlicky, and salty with a little heat from the pepper and a little tang from the vinegar. It is amazing and beyond easy to make. This version of chimichurri is a twist on traditional chimichurri. Instead of oregano, I have substituted fresh mint leaves to complement the lovely lamb chops that I get from my CSA. My introduction to the combination of lamb and mint — the mind naturally conjures up images of adorably delectable baby lambs fattening themselves on tender sprigs of mint and other herbs as if to say, “Here I am and I am pre-seasoned!” — came when I was spending a lot of time in Wales. A slick of mint sauce, usually store-bought and straight from a jar, was used to coat salty little marsh lamb chops in a sheen of jelly. Looking back, those chops would have been much better served by something fresher and more spring-like. In lieu of red or white wine vinegar, I have opted for unfiltered apple cider vinegar which adds a little bit of sweetness to the final result. I actually got the idea to swap vinegars from the wonderful Hannah over at Inherit the Spoon, whose recipe inspired this one. As you can tell, chimichurri is quite flexible; you can adjust it to your personal tastes as you go along. What is given below is a reflection of what I like to eat, namely more salt and less tart, but you should feel free to play around with it. If the sauce feels too chunky, add more olive oil or more vinegar. Too tangy? Too garlicky? Too spicy? Add more herbs. As a useful gauge, the final consistency should be like fine pesto. That being said, you can leave the sauce rougher if you prefer. It will still taste wonderful. 1. Generously salt both sides of the lamb chops and let them come up to room temperature while you prepare the sauce. 2. Combine the herbs, the garlic, the red pepper flakes, and the apple cider vinegar in a food processor with a hefty pinch of salt and a good grind of black pepper. As the processor is going, add the olive oil in a steady stream until you reach your desired consistency. Adjust the seasoning if needed. Keep the sauce covered in the fridge until you are ready to cook the chops. 4. Once the lamb chops have come up to room temperature, pat them dry with paper towels. In a heavy-duty, oven-safe skillet large enough to hold the chops without crowding them, heat about 1-2 tablespoons of rice bran oil or another kind of oil with a high-smoke point until the surface of the oil begins to shimmer. Arrange the chops in a single layer and let them cook undisturbed until you have a nice sear on them. When properly seared, the chops should release easily from the pan if the pan was hot enough to begin with. Flip the chops and move the pan to the oven. You want to aim for them to be medium-rare. An instant read thermometer should read 135° when inserted in the thickest part of the chop. This should take about 7-10 minutes depending on how thick your chops are (mine were about 1.5 inches thick) and how many are in the pan. When the chops have reached the appropriate level of doneness, remove the pan from the oven and transfer the chops to a plate to rest for 5 minutes. I bookmarked this … we almost always have mint sauce/jelly with roast lamb or chops and the new twist on Chimichurri sounds great. Wales is reputed to have *the* best lamn and I have spent a lot of time there too (as a child) … where were you? It was great! Do let me know how it goes if you try it! Welsh lamb is very, very good. For the most part, I was in Cardiff and sometimes in Aberystwyth, which was where my old boyfriend from. How about yourself? My grandparents lived in a little village called Seven Sisters not far from Neath. I remember being draged shopping to Cardiff with my mother and grandmother! I have very fond memories of Wales despite being grumpy and negative for much of the time. That is something that I take responsibility for. There is quite a lot that I liked and I should have been more thankful for them at the time. Cardiff had some very charming arcades that I hope are still around. Since the last time I was there, I think a massive shopping center has opened. Wow, wow, wow! Lovely food Daisy! And how exciting you’ve been to Argentina! The farthest part of the world where I’ve been was London (for 30 minutes) and Haga in the Netherlands. is that green sauce/paste on the meat the chimichurri you’re mentioning? It looks delish. I love my food green, the more green the better! Thank you, dear Lucas! I am certain that you will get the chance to travel more once everything is a more settled school-wise. Yes, that green sauce is the chimichurri! Aren’t green sauces wonderful? So fresh and just perfect for the summer months. That sounds delicious, Lucas! Another wonderful green food! What did she put in it if you don’t mind me asking? a lot of broccoli and I think a potato or two. Everything blended, the base was a chicken brot. One of my friends grew up in Argentina – her chimichurri is to die for!!! Thank you for the kind comment! I bet your friend’s chimichurri is to die for! That is the best to be able to learn and taste from a native. This version may be non-traditional, but it tastes so springlike that it makes me smile. If you try it, do let me know how it goes! How many times can I click the “like” button?! Oh, my mouth started watering the moment I saw the picture. I’d like to eat lamb more often but I rarely see it at the store. 😦 I clicked on the “little marsh lamb chops” link with interest. The father in “Alaska: The Last Frontier” show grazes his cattle in a salty marsh and he says it gives them a distinctive taste. When Hubby and I went to Bar Harbor we saw deer grazing in the salty marsh and the tour leader said that deer love the marsh because it gives them nutrients that are hard to find. How long does fresh chimichurri last in the fridge? I love your fresh mint idea! I bet it adds a nice twist. Mint is my new “must have” in the garden. There’s a million uses for it. Great post once again, my friend! Scrumptious as always! Lamb is not the most economical meat, but in the springtime, if you can get a nice, fat chops, it is so worth the splurge! But I am sure the chimichurri would be just as good on chicken, pork, beef, anything really. I just started dredging bread through it and dunking vegetables in it because it was so delicious. In an air-tight container, the sauce should last about a week. The sauce might get darker as mint tends to oxidize faster than parsley. The pepper and garlic flavors might become more pronounced, but it should be okay. That being said, you can always freeze extra. Thank you again for the kind compliments! I like freezing pesto too. I find that if you do as individual packets, it can be a life-saver when you are starving and want something nice to eat! Thank you, Kay! Yes, this is great date-night food. Garlicky, but if you’re both eating it . . . 🙂 I agree that any woman who makes this deserves a foot rub 🙂 Thank you again for the kind comment! I can’t believe I’ve never heard of chimichurri! What an excellent name for a sauce. And i appreciate your ability to eat steak for lunch and dinner everyday. And there’s not much wrong with that – good iron intake, good red blood cell production or something. Wales? How did you ever end up there? Thank you so much, trixfred! Chimichurri is a great word, isn’t it? Yes, it was quite the decadent summer. At first, I thought that essentially being on the Atkins diet would make us lose weight. However, I think the sheer quantity that we ate negated that! As for Wales? My old boyfriend was Welsh and we did the long distance thing for a very long time. The chops should release from the pan when they are seared, assuming the pan was hot to begin with. My husband would love your lamb chops! That is an excellent point, Scroungelady! I will add it to the instructions above. Thank you! Thank you, dear Kafka! Yes, I do use oregano when I have it. Sometimes I forget to pick some up at the store and do without. I have also used a combination of cilantro and parsley, which is also quite traditional. I bet your’s is delicious. that looks delicious and love the photos. Chimichurri on anything and if it’s pork, even better 🙂 I too visited argentina years ago, and it was steak and wine everyday, but don’t recall seeing chimichurri anywhere… that’s odd. I’ve made it at home many times, specially during summer time, lots of BBqing around here 🙂 great post! Thank you so much! It’s good to know that there is someone else who didn’t see any chimichurri either. Maybe the hide it from foreigners? It’s terrific for barbecues. I am super envious that you have a grill! Thank you again for the kind words and for dropping by! Why did I just construct a sentence like Yoda?! I think that my brain is on vacation too! Thanks for the comment, Michelle! Sad to hear about your lamb though. Was it the weather this year? Gorgeous lamb chops! And the color of the chimichurri! I’ve never made that but need to try. Yummy! This looks so good. I laughed on the pre-seasoned lambies. Tofu the bunny also loves herbs, as do I. Hope no one eats us! My dear, you have just made me gain 5 pounds from reading your post. I LOVE chimichurri. I will give this recipe a try…yumminess! Thank you, dear Scented Hound! Fabulous! I can’t wait to try it. Have you tried chimichurri on chorizo? Thank you, Sandra! I have never tried chimichurri on chorizo but now I must! That sounds amazing! Thank you for the kind comment and for dropping by! Daisy you are so very, very clever. 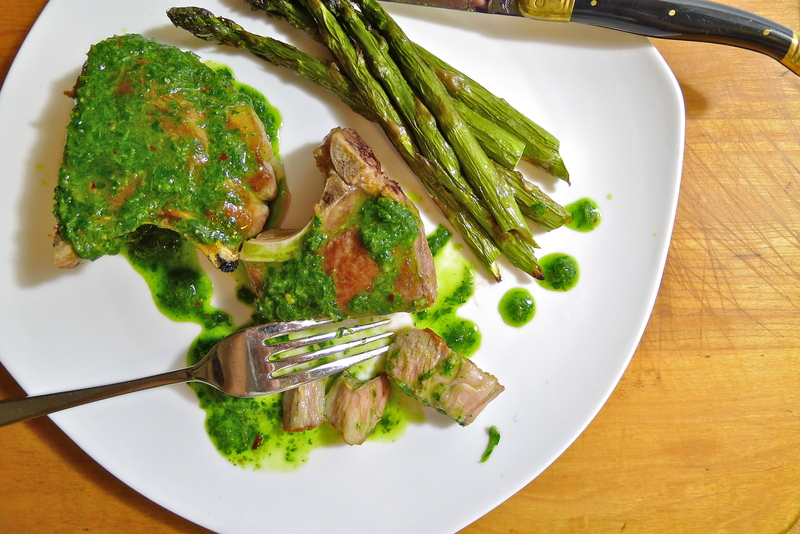 Mint chimichurri on lamb – this feels like some sort of “ah ha!” moment, like OF COURSE we should all be doing this. Can’t wait to try it – we are in prime chimichurri season, so hopefully soon (I’d guess lamb season is probably ending shortly, so maybe even very soon!). Thank you, Hannah! Now that it is officially summer, it is most definitely prime chimichurri season! Lamb season probably is over and I seem to have missed most spring vegetables too — too short of a season and too sad! Thank you again the inspiration! You and Gabe are culinary geniuses and your family and friends are super lucky! I hope that the move is going well and all the boxes are almost gone! I love how you’ve slathered the lamb in chimichurri. I too went to Argentina and don’t *specifically* remember chimichurri … but maybe all the other steak I mean food I was eating blocked it out? Either way, this sounds delicious. And I covet your beautiful little lamb chops! Wowzer with the chimichurri. I also don’t recall having chimichurri in Argentina when I was there for a week about 5 years ago! I remember the food being good and inexpensive. As for lamb, ewe! The food is awesome! And very inexpensive for us. Love Argentina! Chimichurri is a great idea. It’s hard for me to get local lamb but I bet I can use goat? I bet it would be delicious on anything! How would you prepare the goat? Slow-cooked goat with spices or mole sounds delicious.